It’s beginning to look a lot like a record holiday shopping season. Based on early results from Black Friday and projections for today’s “Cyber Monday,” e-commerce sales are on track to surpass previous records by a couple of billion dollars. Adobe: 25.3% expansion in Thanksgiving and Black Friday e-commerce sales (vs. 17.7% in 2017). Salesforce Commerce Cloud: 13% expansion in Black Friday sales (vs. 32% last year). 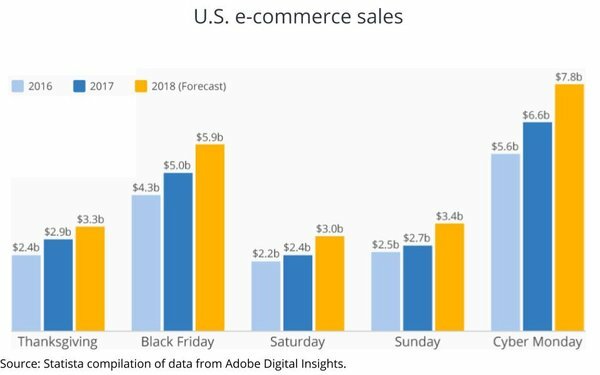 Adobe, meanwhile, projects today’s e-commerce sales will expand more than 18% to $7.8 billion, which would bring the Thanksgiving through Cyber Monday sales to $23.4 billion, setting a pace for a record holiday shopping season and Q4 U.S. retail sales expansion.